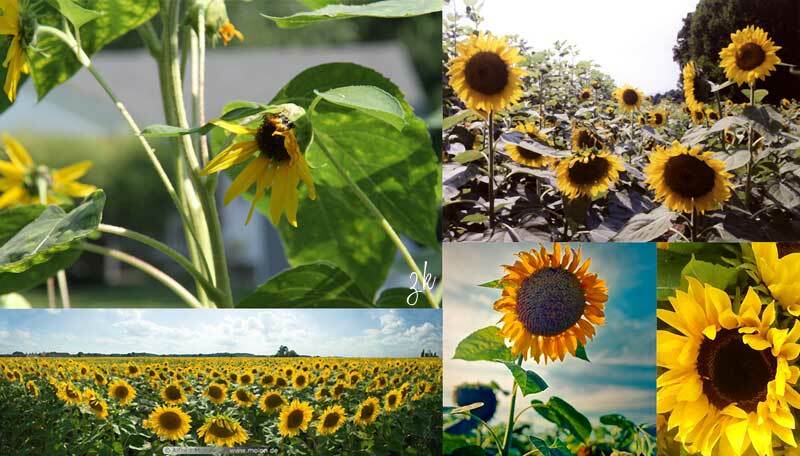 Home » Commissions » Sunflowers? Yes please! Time for another commission! This one is a large endeavor both in regards to size and subject matter. I’m excited to start painting as it will make me feel a little like I’m following in van Gogh’s footsteps, though I am certain at the end both my ears will stay intact! Step One: What is the painting for? It’s an oil painting commission for an office boardroom. It’s to be cheerful and welcoming. Step Two: Find an image. The idea of flowers being the subject matter was always predominant during the concept stage. 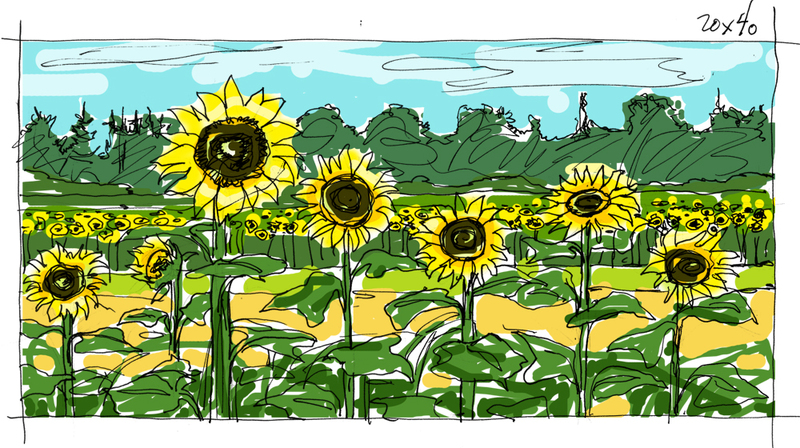 It eventually evolved into Sunflowers, then a field of sunflowers. Unfortunately I did not get a chance to actually visit a field of sunflowers, though next summer I will make it a goal of mine to do so! Since I could not provide the image on my own I did some searching online…I created my final design using a variety of photos, though I did include a few photos of my own which were a multi-branched variety. Step Three: Crop and adjust the image. Since I did not have one image as a single reference I decided to start with the painting size. The painting is to be hung on a reddish coloured brick wall and it’s not to over power the room (the brick pattern is pretty powerful on it’s own) yet the painting should have some sort of presence. The size was finalized at 20 x 40 inches, with a Gallery Depth of 1.5 inches. This panel was custom made since my local art store does not carry that dimension in wood panel, boo 🙁 It seems I’m forever running into this problem! After the final size was decided I drew a scaled design using one of my favourite rulers…the scale ruler! Step Four: Prep the painting surface. I’ve mentioned many a time that my painting surface of choice is wood (panel). I like how the paint doesn’t battle me when I apply it onto the surface. I find with canvas there’s a give that slows the painting process down, which makes it feel like a battle. I still have more than a few blank canvases floating around in my studio, which means we’re in the middle of an armistice. Anyways, to prep a wood panel I usually paint three or four coats of acrylic gesso onto the surface and onto the sides. Each application has a light sanding between coats. This is the time when I can chose to add texture by not blending in my brushstrokes to make them level. Most of the time I just focus on applying the gesso and texture ends up being serendipitous. Secretly, I long to paint on a thickly gessoed surface. I compensate this desire by applying my light areas in a more direct manner, which leaves a nice body to the surface. Step Five: Print out reference imagery and add grid lines. I have about three reference sheets printed out at the moment, with possibly one or two more on the way. My main reference image was my initial rough, that was a hybrid of a sketch with added colour using Photoshop. I didn’t make a full set of grid lines for this painting because of the subject matter being “organic”. Step Six: Transfer image onto painting surface. As aforementioned, grid lines were minimal. I only decided on the vertical and horizontal centres being draw with a ruler because my intent was to transfer the image using the “Organic transfer method”; meaning free hand drawing with little to no grid reference. Central grid markings are extremely helpful, especially when the design is still being tweaked. It was during this step that I altered the design. 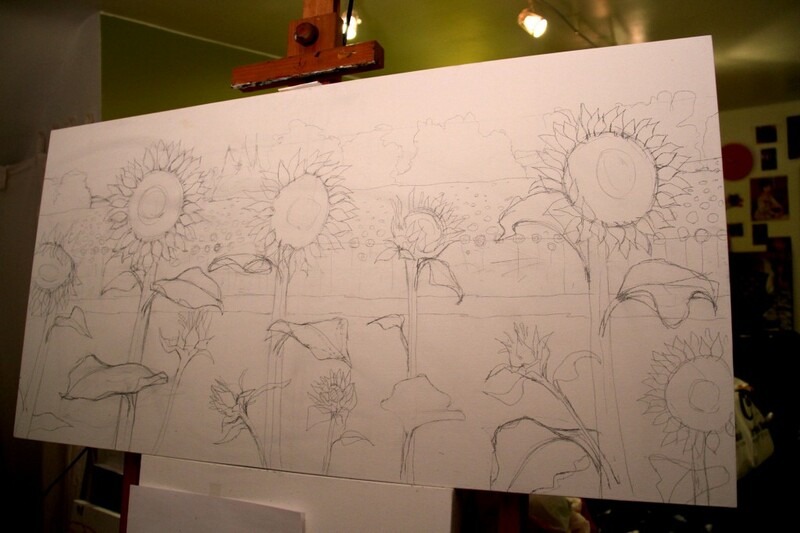 I wanted the sunflowers to be close to life size and I wanted the leaves to look more natural. I also wanted to make sure that I didn’t have horizontal areas that were directly on centre with the midway point (10 inches). Ultimately the image will be altered even further once I start painting. It’s inevitable but it’s a step that is necessary to make sure that the overall shapes are “working” together. Sometimes you don’t notice an “odd” area or shape until it’s filled in with colour, plus, a pencil is nothing compared to a brush. The application creates a whole new feel and dimension to the design. It’s always a pleasant surprise when you realize that the final painting has actually turned out to be much better than the initial design or reference image. Step Seven: Colour wash. This is my next step. I think for this piece I will use a cadmium yellow as the underlying colour. I want the final painting to feel warm and sun soaked with cool shadows.